Seeking fun, prizes, and glory? 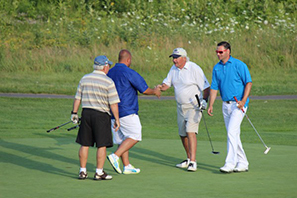 The Tour organizes and runs competitions of all kinds, for players with handicaps from 0 to 30. 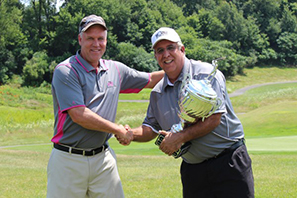 Each tournament offers prizes for both gross and net, usually awarding about 20% of the field. Show up at the registration table, get your scorecard, meet your foursome, and give it your best. [Some of] these guys (and gals) are [pretty] good. The average handicap is about 11.5, but some of us can bust par once in awhile, and others struggle to break 100. Each player is always entered in both gross and net pools for each event. In many events, we play split tees to match players’ abilities. We like variety. We play stroke play, stableford, team events (fourball, ABCD), and 27-hole mixed format days. We also host internal Ryder Cup-style matches, and play against other clubs as well. Plus there’s a season-long match play event that’s very popular. In each event, you can also earn Grand Prix Points toward Player of the Year honors. Go for it. In addition we offer closest-to-the–pin prizes for every par 3. We also offer optional side pools for gross and net skins. Boston Strong. There’s even a national championship in Florida at the end of the year, where we compete as a team and individually against Chicago, Pittsburgh, Atlanta, and other cities. If you like to compete, you have to join The TOUR. Check out this year's schedule.